Throughout her illustrious career, Maria has led change and pioneered successful initiatives at the corporate and government levels. She is responsible for human resources, supplier and workforce diversity, and executive leadership at Lang Strategies, LLC. Maria was Fannie Mae’s first vice president for diversity and work-life initiatives. During her 12-year tenure, she led one of the top award-winning diversity programs in the country. 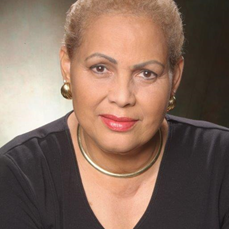 She was responsible for designing programs to increase the diversity of the workplace, increase contracting with minority and women-owned businesses, and creating programs to foster an environment of inclusion at all levels of the organization. She also revamped the Human Resources Call Center processes and procedures to improve service delivery and morale. Prior to joining Fannie Mae in 1992, Maria was appointed by former DC Mayor Sharon Pratt Kelly to design and serve as the first chief administrative judge for the District of Columbia’s Office of Employee Appeals Temporary Appeals Panel, an agency formed exclusively to hear employee appeals resulting from the first major downsizing of city government. She was also a commissioned officer in the United States Navy Reserve Judge Advocate General’s (JAG) Corps for 15 years. First African American woman to serve in the U.S. Navy JAG reserves. Designed the cutting edge Corporate Justice System at Fannie Mae, a unique internal employee grievance program designed for the non-union work environment. Presidential appointed/ senate confirmed vice chair of the U.S. Merit Systems Protection board, a federal labor adjudicatory agency, from 1983-1990. Maria is a self-proclaimed workaholic. When she is not working, she enjoys reading about such topics as military history, espionage and legal thrillers. You can also find her out on the greens with her golf clubs and swimming laps in the pool when the weather permits.